The research by the information visualization community show clearly that using a visual representation of data-sets enables faster analysis by the end users. Tulip, created by David AUBER, is a contribution of the area of information visualization, “InfoViz”. Even if the Tulip framework enables the visualization, the drawing and the edition of small graphs, all the parts of the framework have been built in order to be able to visualize graphs having to 1.000.000 elements. 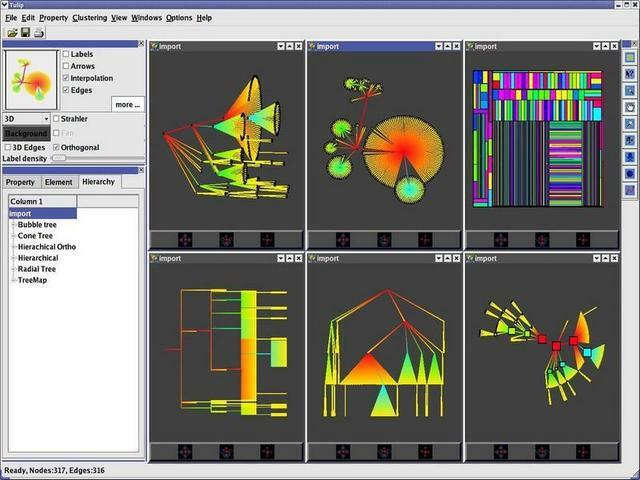 A visualization system must draw and display huge graphs, enables to navigate through geometric operations as well as extracts subgraphs of the data and allows to change the representation of the results obtained by filtering. There is also Gephi, a Java-based interactive visualization platform for networks. It’s a kind of Photoshop/GIMP for graphs allowing you to explore the data in a reactive interface.